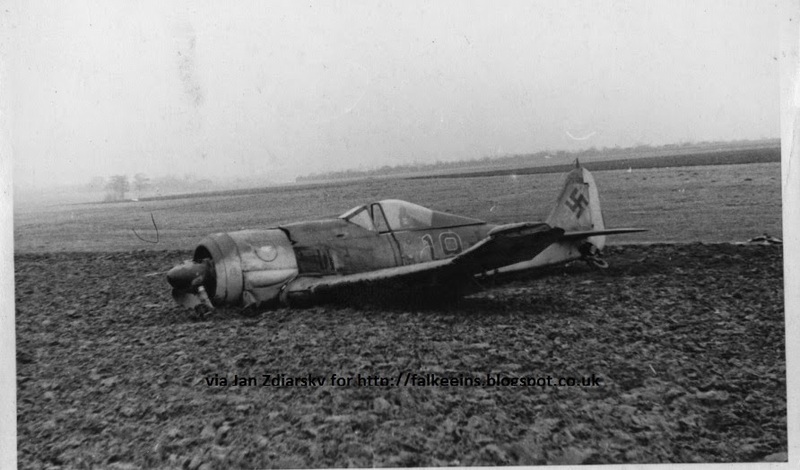 .. courtesy of Jan Zdiarsky via Günther Landgraf, are these two pictures (from one photo) showing an unknown Fw 190 following a belly landing in a field. There is an interesting but not clearly visible unit emblem on the nose. Unit emblems are not exactly a speciality of mine so any information here would be appreciated. Looks like a bird - perhaps a stork or similar. Günther's father Erwin Landgraf was a former Bf 110 pilot with ZG 26. He was downed over France in 1940 and badly injured... and never returned to a combat unit. As a result of his injuries Günther Landgraf could only resume flying as a test pilot at the Zwickau repair factory. There he flew several types of aircraft, including Fw 190s... Jan and Günther believe that this machine is one of those test flown by Erwin which was photographed after Erwin had to carry out this Bauchlandung following an in-flight emergency..
" ...The emblem on the Fw 190 you've posted yesterday on your blog (from Erwin Landgraf) should be the running boar of I./JG 110, formerly Blindflugschule 10 (Wilde Sau training). The same emblem can be seen on Fw 190 S "White 30" at Köthen, also on your blog here..." .. that is ironic, thank you Chris!